Introduction: The Laundry Department plays an important role in preventing the spread of infection and continuously supplying clean linen to various departments in any hospital. 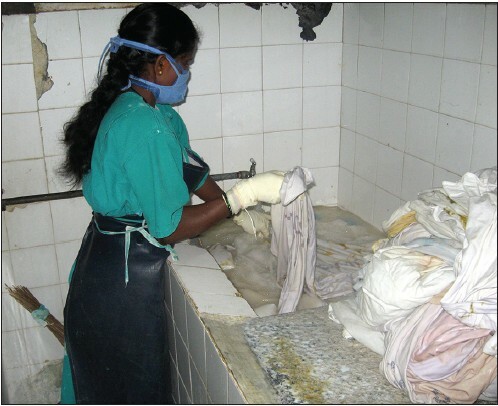 Objectives of the Study: To identify existing practices and occupational safety and health (OSH) measures in the Laundry Department and to assess the use of personal protective equipments (PPEs) among health care workers. Materials and Methods: A cross-sectional study was carried out in a private tertiary care teaching hospital. An observation checklist was developed, which was partially based on occupational hazard checklist of OSHA for Laundry Department. This was field tested and validated for applicability for this study. Results: The potential biological hazards are infections through exposure to aerosols, spills and splashes during various activities, fungal infection due to wet clothes and environment and infections through fomites. The potential physical hazards are injuries due to slips and falls, exposure to heat, humidity, dust, noise, and vibration. The potential chemical hazards are contact dermatitis and allergic asthma due to exposure to detergents, phenyl solution, bleaching powder, and soap oil solution. The potential ergonomic hazards are musculoskeletal diseases and repetitive stress injuries at the shoulder, elbow, and small joints of the hands. PPEs were not used consistently in most areas of the department. Occupational health and safety (OHS) is defined by the OHS advisory services 18001 (OHSAS 18001) as "conditions and factors that affect, or could affect, the health and safety of employees, temporary workers, contractor personnel, visitors or any other persons in the workplace. "According to the US National Safety Council "effective occupational safety efforts involves the control and elimination of recognized workplace hazards to attain an acceptable level of risk and to promote the wellness of workers. Optimal occupational safety results from a continuous proactive process of anticipating, identifying, designing, implementing, and evaluating risk-reduction practices. " Studies documenting the incidence of needle stick injuries among HCWs are available the same is not the case with respect to Laundry Department's personnel. [7-13] This ancillary department plays a vital role in preventing infection by supplying linen. To assess the use of personal protective equipments (PPEs) by various categories of HCWs in this department. The study setting was a private tertiary care teaching hospital located in Bengaluru city with bed strength of 1200 beds and bed occupancy of approximately 85%. The hospital provides super specialty and sub-specialty services at out- and in-patient departments and at outreach areas. Laundry Department that is integral to the optimum functioning of the clinical services that are provided. Currently working individuals who consented to participate in the study. Currently working individuals who could not be met at work place even after three attempts. The survey was undertaken between September 2009 and August 2010. The questions were based on the literature review on hazards for the workers involved in these activities. The checklists were face validated by three experts in the field of occupational health working in large tertiary care hospitals in Bengaluru city and their comments and suggestions were incorporated. Multiple visits (at least five visits) were made and the activities were observed in order to document the work processes and occupational safety measures in place therein. An unannounced visit was also made to observe the practice of use of PPE. Informed consent was obtained from the workers before the factors determining the appropriate use of PPEs were identified by administering a pretested schedule to them. Selected workers in the department. The data collected were entered into Excel Spreadsheets and analyzed using Microsoft Excel. Frequency tables were used to describe the distribution of study variables in the population. Use of PPEs among the workers. Tailoring section: In this room, the damaged clothes are stitched. The workers at the washing area are also exposed to aerosols generated during the washing process and also possibly by the ingestion of droplets generated due to splashes. The worker at the pressing area is exposed to the hazards of burns and scalds, heat and humidity. The workers are exposed to cotton dust, especially in the linen collection area and tailoring unit and folding area. They are exposed to dust during the activity of collecting of the dried clothes from the spreading area and linen folding area. The height of the hydro extractor machines used for drying of the washed linen is at the mid-thigh level, due to which the workers repeatedly bend and extend the back while loading and unloading the machine hence straining lumbar spinal region. They are also more prone for the MSDs, especially low back ache and side strain while pulling the entangled linen out of the extractor. The workers are at risk of MSDs due to repetitive bending and standing while drying clothes in Linen Drying area [Figure 2]. Ear plugs: The workers did not use ear plugs as they were not provided to them. At the folding area the workers used mask inconsistently. The reasons were that it was difficult to breathe and to communicate with other workers during work. 77% of the workers in the Laundry Department were males [Table 3]. Among them 67% were <35 years of age 23% of all employees were permanent employees and 77% were contractual employees. There were equal number of males and females among permanent employees; however, among contractual employees 85% were males [Table 4]. Twenty employees (65.5%) had work experience of <10 years and 15 workers have >10 years of work experience. [Table 5] summarizes the distribution of workers according to their designation and gender. All the ward boy and supervisors were males, while department in-charge and tailors were by females. The workers did not wear masks or goggles while spreading the washed clothes as most of them thought it is not necessary as the linen was washed and clean. 77% of the males were contractual laborers and as already discussed the workers could not access the medical and social security schemes in the hospital. However, all workers did have a periodic health appraisal during which they were examined and referred to respective specialties for free consultations. 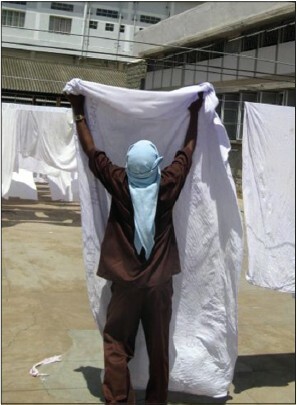 The workers at the receiving area, dirty linen washing area, and washing area are more at risk of biological hazards of infections as they come in contact with the linen soiled with body fluids and may also inhale the aerosols generated due to activities in these areas [Figure 3]. The ventilation and lighting in the dirty linen washing area was not satisfactory. Therefore, the chance of infection due to aerosols is more. However, only the worker at the dirty linen washing area used appropriate PPEs, rest of the workers who do not use PPEs. The reasons for the same are explained later. The workers are administered hepatitis B vaccine. Three of the workers reported hepatitis B infection. In the washing area, dirty linen washing area, and at the linen squeezing area the floor was slippery due to spillage of soap oil solution and waste water. Even though, major injuries are documented it was seen that minor events were not registered in the department. Fitting the job to the person and specific person to specific jobs may prevent the accidents periodic inspection and maintenance of the machines will prevent the hazards due to vibration and noise. The physical and environmental hazards were common in linen washing area and linen squeezing area. Proper housekeeping will prevent the stagnation of soap oil solution and may reduce the hazards. Proper and regular maintenance of the machines may prevent the hazards of noise and vibration. Faculty, Department of Community Health, St. Johns Medical College and workers of Laundry Department. 1. Pingle SR. Occupational health. The Godrej House Magazine 2005;5. Available from: http://www.change.godrej.com/2005/septOct/OccupationalHealth.htm. [Last accessed on 2009 Aug 30]. 2. Dunmire T. What is occupational safety and health? OHSAS 18001 Expert Blog, 2007 July 11. Available from: http://www.ohsas18001expert.com/2007/07/11/what-is-occupational-safety-health/. [Last accessed on 2009 Sep 03]. 3. National Safety Council. Occupational safety terms and concepts. Available from: http://www.nsc.org/resources/issues/safetyknow/safety_terms.aspx. [Last accessed on 2009 Sep 09]. 4. Rosenstock L, Cullen M, Fingerhut M. Disease Control Priorities in Developing Countries: Occupational Health. 2 nd ed. New York: Oxford University Press; 2006. p. 1130. Available from: http://www.files.dcp2.org/pdf/DCP/DCP60.pdf. [Last accessed on 2009 Sep 07]. 5. Russi MB, Howarth MV. Occupational medicine in health care industry. In: Rosenstock L, Cullen MR, Brodkin CA, Redlich CA, editors. Text Book of Clinical Occupational and Environmental Medicine. 2 nd ed. USA: Elsevier Inc; 2005.p.245. 6. World Health Organisation. The World Health Report 2006, Working Together for Health: Health Workers a Global Profile. Geneva: WHO Press; 2006. p. xvii-xviii. Available from: http://www.who.int/whr/2006/chapter 1/en/index.html. [Last accessed on 2009 Aug 30]. 7. Aiken LH, Sloane DM, Klocinski JL. Hospital nurses' occupational exposure to blood: Prospective, retrospective, and institutional reports. Am J Public Health 1997;87:103-7. 8. Gurubacharya DL, Mathura KC, Karki DB. Knowledge, attitude and practices among health care workers on needle-stick injuries. Kathmandu Univ Med J (KUMJ) 2003;1:91-4. 9. Bhatt G, Pataki B, Pratinidhi A, Gupte A, Desai A. Knowledge and awareness amongst the nursing students regarding risk of HIV infection through accidental needle stick injury. Indian J Community Med 2004;29:26-30. Available from: http://www.ijcm.org.in/article.asp?issn=0970-0218;year=2008;volume=33;issue=1;spage=26;epage=30;aulast=Singru. [Last accessed on 2009 Aug 24]. 10. Rele M, Mathur M, Turbadkar D. Risk of needle stick injuries in health care workers - A report. Indian J Med Microbiol 2002;20:206-7. 11. Mehta A, Rodrigues C, Ghag S, Bavi P, Shenai S, Dastur F. Needlestick injuries in a tertiary care centre in Mumbai, India. J Hosp Infect 2005;60:368-73. 12. Balachandran S. Nurses and the occupational risk of blood-borne infections. Indian J Med Ethics 2003. Available from: http://www.issuesinmedicalethics.org/104di088.html. [Last accessed on 2009 Aug 30]. 13. Khuri-Bulos NA, Toukan A, Mahafzah A, Al Adham M, Faori I, Abu Khader I, et al. Epidemiology of needlestick and sharp injuries at a university hospital in a developing country: A 3-year prospective study at the Jordan University Hospital, 1993 through 1995. Am J Infect Control 1997;25:322-9. 14. Occupational Safety and Health Administration. U.S. Department of Labour. Hospital Etool/Nursing Home Etool: Laundry Module; 1999. Available from: https://www.osha.gov/SLTC/etools/hospital/laundry/laundry.html. [Last accessed on 2009 Aug 30]. 15. Centre for Disease Control and Prevention. National Institute for Occupational Safety and Health. U.S. Department of Health and Human Services. Guidelines for Protecting the Safety and Health of Health Care Workers. Recommended Guidelines for Controlling Safety Hazards in Hospitals. DHHS (NIOSH) Publication no. 88-119; September.September. United States. DHHS (NIOSH) Publication; 1988. p. 3-2. 16. Heads of Workplace Safety Authorities (HWSA). Final Report: Safe Steps - Manual Tasks, Slips and Trips in Hospitals National Intervention and Compliance Campaign, Dec 2008. Available from: http://www.hwsa.org.au/files/documents/Activities%20-%20Campaign%20Final%20Reports/1a6859e9-f00f-49be-9079-96. [Last accessed on 2009 Sep 09].